Tron: Legacy offers a decidedly mixed inheritance as far as sequels go, demonstrating once again that visual pyrotechnics can’t entirely substitute for an involving story. As if we needed reminding. I say this as one who had been looking forward to Tron: Legacy, mostly because of undeniable advances in computer-generated imagery, technology that was in its infancy whenTron — regarded as a technical groundbreaker — first hit the nation’s screens in 1982. For the first 30 or so minutes, I felt as if my anticipation had been rewarded. Director Joseph Kosinski, who has made a major splash in the advertising world, tops the digital environment of the original, particularly for those who see the movie in IMAX 3-D. But Legacy’s intricately imagined visual world eventually falls prey to the truth of a cliché: Familiarity breeds a bit of contempt as Kosinski’s color palette — heavy on blacks with orange piping — succumbs to monotony. The world ofTron, which must have been intended to evoke a bedazzled succession of “wows,” begins to resemble the inside of a giant toaster oven, coils aglow. The screenplay for Tron: Legacy hosts a mash-up of familiar themes: the search for an absent father, the desire of artificially created creatures to enter the real world and the guilt of a genius creator who hasn’t anticipated all the consequences of his well-intended invention. A story recap seems almost superfluous in a movie that invests most of its capital in action and visual effects. Suffice it to say that young Sam Flynn (Garrett Hedlund) enters the world of Tron to search for the father (Jeff Bridges) who vanished when Sam was still a boy. Once inside this digital world, Sam faces a series of stern tests as he tries to return to “reality” through a fast-closing portal. Sam’s attempts to exit from The Grid, as its inhabitants refer to the expansive, artificial world, brings him into conflict with Clu, a digitally created tyrant who looks like a younger version of Bridges’ character. Why not? Bridges’ Kevin Flynn created Clu, who has turned into his evil alter ego. Sam is assisted in his struggle by Quorra (Olivia Wilde), a digital creation with a pageboy haircut, a sleek punk look and a fashionably pallid complexion. Quorra holds the key to both mankind’s advancement and to fan boy libidos. At one point, Michael Sheen shows up as a Grid resident with vaudevillian flare and a haircut that makes him look like a cut-rate David Bowie. He carries a cane, and prances about like someone who’s hell bent on providing arch comic relief. But to what purpose? Like lots of other things in Disney’s somewhat juvenile helping of sci-fi, Sheen’s Zeus seems more adornment than anything else. Kosinski does some of his best work when re-imagining the Light Cycles that became familiar in the first installment, and he deserves credit for creating a sense of dark spaciousness within the world of The Grid. But as Legacy wears on, its imagery seems to disconnect from the story, turning into more stuff to stare at, either approvingly or with disinterest depending on one’s bent. Those who go along for the Legacy ride probably won’t care that the movie boasts some of the worst dialog of the year, so lame that even Bridges (who’s likely to earn a best-actor nomination for his work in the upcoming True Grit) is forced to deadpan his way through nearly every scene. His character tries to ignite the occasional countercultural spark, but the lingo seems more dated than funny. I wonder. Is it possible that the whole idea ofTron — penetrating a digital world — is passé? These days, such a premise seems less like sci-fi than a description of the average teen-ager’s life. 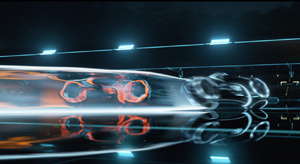 Tron: Legacy may appeal to fans of the original, as well as to those for whom visual kicks are sufficient reason to see a movie. I might have been able to join the latter group had Kosinksi done more to mix his visual pitches instead of tending toward repetition. Like Bridge’s character, I began to feel trapped in a digital world. I don’t know how you’ll feel, but somewhere around the half way mark I started wondering where I might find the nearest exit portal.